Innovative Business Advisors and American Business Network today announced that they have combined and become Innovative Business Advisors, LLC. The merger creates a strong team of seasoned professionals providing Business Mergers & Acquisition Services, Business Valuation Services and Business Advisory Services. 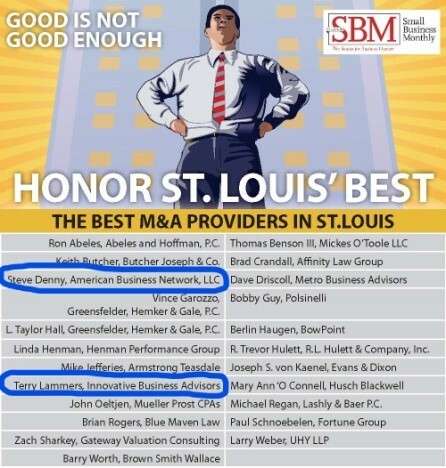 Both firms were honored recently to be recognized as “The Best M & A Providers in St. Louis” by Small Business Monthly magazine and their combination is designed to enable a larger, more comprehensive range of services for their clients. The new entity will maintain offices in O’Fallon, Missouri and O’Fallon, Illinois. Additional information can be attained through the website at www.innovativeba.com, by phoning the office at (636) 549-8150 or (618) 688-2018, or by submitting your information to us through our Contact Us page.